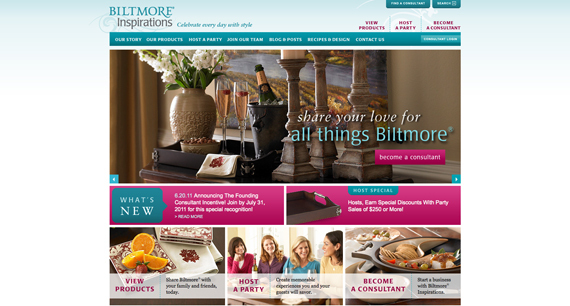 Biltmore just launched a brand new home party company and a brand new web site to go with it: Biltmore Inspirations. They contacted Rivers Agency to design and develop the web site. The site serves as a new home-based party planning system. The web site allows users to view Biltmore products, register to host parties and join the Biltmore Inspirations team as a consultant. It also includes a newsfeed and a blog to keep visitors up to date, as well as recipe and design section to help hosts and visitors plan parties and entertain guests. We really enjoyed this project, and after receiving feedback from Biltmore, we know that they are happy with the results, too. I was just thinking of you and wanted to express how much I appreciate the amazing work that you and your team produced for the BI website (corp and consultant). We are getting RAVE reviews and your agency has helped us launch our new business with finesse!! Thank you, thank you, thank you so much!!! It is always so much fun working for the Biltmore team, and we can’t wait to see what they do next!